Next departure from San Sebastian to Paris is on Sat, 1 Jun. We recommend you stay with Koisi Hostel. Rated 92% on Hostelworld. Koisi HostelWe are situated in El Antiguo (named precisely for being the original nucleus of the city), that lies adjacent to Ondarreta Beach and Mount Igeldo. It is a peaceful and elegant area, but also very vibrant. Home of some of the best tourist attractions such as the Palacio Miramar, Concha Bay, Ondarre… read more. The LocationWe are located in El Antiguo neighbourhood. A 5-minute walk from Calle Matia where you can shop in traditional shops or eat pintxos in one of its crowded bars. We are close to Ondarreta Beach and Monte Igeldo, and other tourist attractions such as the Palacio Miramar, Concha Bay and the Peine del Viento, one of the city’s most iconic and beautiful corners. Strolling along the Playa de la Concha in 20-25 minutes you can reach the Center and the Old Town where you can enjoy Basque gastronomy. We are situated in El Antiguo (named precisely for being the original nucleus of the city), that lies adjacent to Ondarreta Beach and Mount Igeldo. It is a peaceful and elegant area, but also very vibrant. Home of some of the best tourist attractions such as the Palacio Miramar, Concha Bay, Ondarreta Beach and the Wind’s Comb, admirable work of the sculptor Eduardo Chillida and today one of the city’s most iconic and beautiful corners. Conditions: TERMS AND CONDITIONS Check-in & Check-out time Check-in starts at 15.00 and check out is by 12:00. If you arrive before we have a luggage room where you can leave your belongings until your room is ready. Identification A valid passport, EU ID or driver’s license is required for check-in. Stag and Hen dos We do not accept bookings for Stag / Hen dos. Koisi Hostel reserves the right to deny entry to anyone who has booked online and is part of such a group. Age Restrictions Bookings cannot be accepted from any person under the age of 18 unless they are accompanied by an adult (18 or over). Guests who wish to bring their children under 16 years of age must book a whole dorm or private room. We do not have an upper age limit in our dorms but the majority of our guests are backpackers in the 18 to 35 age range. Room allocation If you’re travelling with friends or family, we’ll do our utmost to book you in a room together but this can’t always be guaranteed. If you want to make sure that you aren’t separated from your group, we’d suggest booking a private room or taking over a whole dorm. We have Mixed and Female dorms. Koisi Hostel reserves the right to deny entry to any male who has booked a bed in a female dorm. Payment Please be aware that we only accept cash, Mastercard and Visa card payments. We do not accept American Express, Diners Club cards or any other card. If the name on the card used to book is different to the name on the booking, you will be asked to send us a copy of the card and a photocopy of the cardholder’s ID/Passport/Driving License. Should we not receive these details by check-in time, you will be asked to make a payment for the same reservation with your personal card/cash on arrival and the original card used will be refunded. Cancellation Policy If you wish to cancel or amend your reservation to receive a full refund you will need to notify us by email at least 2 days before the arrival date. Failure to notify us, the first night of the reservation will be charged. In case of a no show, the total price of the reservation will be charged. Room Key Cards When booking a dorm a deposit of 10€ for the Key-Card is needed. If you lose your key card the deposit will be absorbed. When booking a private room there is no need for a deposit but if the key is lost 10€ will be charged on the guests credit card. Special Offers and Packages Koisi Hostel runs a variety of special offers and packages throughout the year. These are open to all guests except group bookings (over 9 people) to which different terms apply. All packages and special offers booked for 2017 onwards will be non-refundable once the booking has been completed. Receipts and Invoices If needed, we can provide receipts for proof of payment of your stay. Guest Behavior The comfort, safety and security of our guests is really important to us. Any guest(s) who, in the opinion of our staff, compromise the comfort, safety or security of other guests, staff or local residents will be asked to leave the hostel premises and will not be given a refund. Guests are expected to respect other guests as well as staff, local residents and property. Smoking Smoking is not permitted anywhere inside the Koisi hostel building. Smoking is only permitted outside the building. Any guest found smoking inside the building, will be fined (50 euros) and asked to leave the premises immediately. A refund will not be issued for the stay. No Drugs Drug use is illegal in Spain. Any guest found using drugs within any of the buildings will be asked to leave the premises immediately. A refund will not be issued. Alcohol consumption We will not serve alcohol to anyone under the age of 18. Due to our bar license, guests cannot bring their own alcohol into the premises of Koisi Hostel. Alcohol is available in the bar and can be consumed there and in the surrounding designated areas only. Personal Property Each bed (in dorm rooms) has a personal locker for small valuable sure at all times. Koisi hostels accept no liability for the loss, theft or damage to guests’ property, however sustained or caused. We strongly recommend guests bring a padlock to use on luggage. Damage to Koisi Hostel Guests will be expected to reimburse Koisi Hostel for any damage caused by inappropriate behavior during their stay. The corresponding amount will be charged on the guests’ credit card. Liability Except in relation to death or personal injury caused by our negligence, Koisi Hostel liability remains, at all times, limited to the value of the services booked, excluding any amendment charges paid to us. Your Information Koisi Hostel will only store and use information you supply to us or which is supplied to us for the purposes of carrying out a contract with you, and to inform you of other services and offers which we make available from time to time. If you do not wish to receive such information please let us know by emailing us at: hello@koisihostel.com Errors and Omissions Any omission or error in sales literature, web pages/sites, order form, quotation, price list, order acknowledgement, dispatch note, invoice or other documents issued by us may be corrected by us without liability. We will advise you of any changes at the time of booking or as soon as is reasonably possible thereafter. Discretion All bookings are subject to availability and Koisi Hostel reserve the right to decline any booking at its discretion. Groups Please contact to our groups department for more information about groups rules. Stylish San Sebastián (Donostia in Basque) has the air of an upscale resort, complete with an idyllic location on the shell-shaped Bahía de la Concha. The natural setting – crystalline waters, a flawless beach, green hills on all sides – is captivating, but the city itself has plenty to offer. Head to the buzzing Parte Vieja (Old Quarter) for tempting tapas bars and gourmet restaurants. Or just get your surf gear together and hit the waves. Hit the beach! 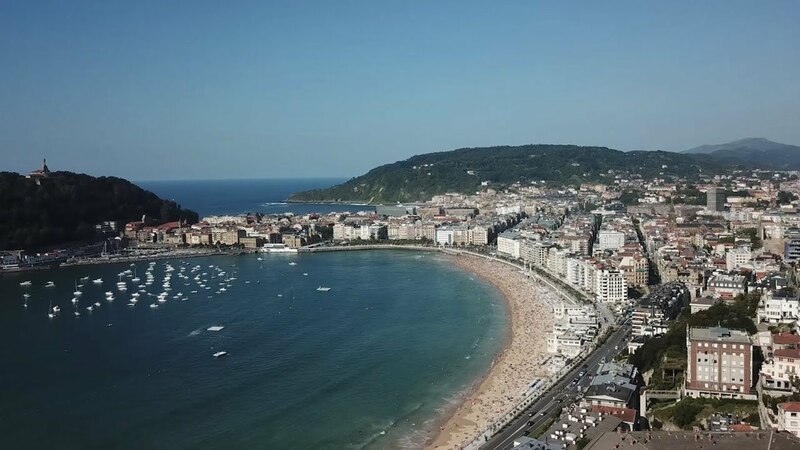 La Concha Beach, Ondaretta Beach, Zurriola Beach - Whether you prefer to swim, sunbather, or surf, the variety of beaches in San Sebastian have got you covered. Monte Urgull A tree covered hill by the beach, with outstanding views and a small history museum at the top. Monte Igueldo Mountain just to the west of town, accessible by funicular and featuring a slightly tacky theme park on top. Aquarium Seaside aquarium with fish from the region as well as exhibits on local fishing & naval history. Santa Clara Island Island in the middle of the Bay of Donostia, between the two mountains, with a lighthouse and nice beach. While this dish can be found all over town, it’s at its creamy, velvety best at the small bar called La Vina, where upon arrival you may notice the many shelves stacked with cakes- that’s how many they go through in a night. It’s nice paired with a dessert wine. This seriously local pintxos bar serves up the best brocheta de gambas around. This classic pintxo presents griddled prawns with a delicious sweet and sour garlic, red, green pepper and onion vinaigrette, served on a slice of crunchy baguette.